Mockingjay Part 2 is a superb final chapter in the adaptations of author Suzanne Collins’s three hugely popular (and excellent) Young Adult novels. As a standalone movie it will make no sense, absolutely no provision is given to people new to the story – it dives beautifully straight back in without a single recap. But it’s reasonable to say that if you are watching this episode as your first experimental dipping-of-a-toe into the world of The Hunger Games, you’re doing it wrong. Go back to the start, do not pass Go, do not collect £200. The Hunger Games is one of those very rare beasts – a series of intelligent blockbusters completely deserving of the interest and acclamation they have garnered. Their success is a combination of some simple factors – excellent source material, excellent writing, excellent acting, and excellent production and direction. You would hope that’s the aim for all filmmakers working now but it’s interesting how many sub-standard movie franchises attempting to grab the same audience have appeared since the first Hunger Games movie came out four years ago. The reason this final movie is so good is that all the emotional groundwork laid over the last three films is paid off, and for what is primarily a science-fiction action movie that is incredibly refreshing. Our hero is Katniss Everdeen, brilliantly played by Jennifer Lawrence. She is the narrator of the books and as such the focal point of the story telling of the film. The scenes which don’t involve Lawrence are few and far between. She is the beating emotional heart of the movie and, like in the books, is as conflicted and complex a main character as you could wish for. There is pain, physical and emotional, which is visible behind the eyes. The manifestation of what is essentially the trauma of war in the a performance is nothing less than astonishing. So, a quick recap. We are in Panam – a future society centred somewhere around the Rocky Mountains in America after some long ago and never spoken of disaster. The population, divided into the Capitol and 12 outlying Districts (the poor and oppressed who supply of all the Capitol’s needs) is undergoing revolution. It’s possibly one of the most overtly left-wing series of movies to come out of Hollywood in years – the rich ruling class subjugating the workers. Quashing strikes. Owning all the wealth. It’s not tricky for the audience to draw parallels. 76 years ago an attempted revolt against the Capitol was brutally put down and every year since two children from each of the Districts have been arbitrarily chosen to fight to the death for the viewing pleasure of Panam’s population. These are the Hunger Games of the title, the idea being to remind the Districts how powerful the Capitol is. Katniss was one of the triumphant gladiators. Since the 75th games ended in a spectacular escape, a revolution against the evil President Snow (Donald Sutherland in great mellifluous form) has been going on, led by the recently discovered 13th District. The Hunger Games: Mockingjay Part 2 continues the revolution which started in Part 1 and takes it to its conclusion. This is a war film intended for young audiences. As such there is not a lot of blood and guts on screen, everything is beautifully edited to show the horror of death and destruction without being laden in gore. You might think that that would remove the teeth from the story, but if anything it makes it more horrifying. Imagination and smoke and sound effects can be as chilling as watching someone bleed out in front of you. Indeed, watching one character whose legs have been blown off die close-up with panic in their eyes is no less effecting because you don’t see the bloody stumps of where his legs once were. Children, adults, favourite characters from earlier episodes… no one is safe. Thematically what makes this movie so emotionally charged is the understanding of loss, of what war can do, that heroes are as capable of killing innocents as the bad guys. The goodies, our friends and the people we are supposedly cheering on are as capable of atrocities to achieve their aims as the oppressors they are fighting. War is hell. And that grey area will be applied automatically by the young audience to all conflicts being fought all over the world. Although we don’t see much blood, the film doesn’t flinch. The war may be futuristic but things like it are going on all around the world every moment of every day. The refugees in the Capitol are also vulnerable people. And for those who have read the books, the character death which is most affecting of all, not least because it is so horribly surprising, is intact. And is absolutely devastating. It is moving and surprising and thrilling in a genuinely edge-of-the-seat heart-pounding way. There is a long sequence in the drains of the Capitol which is terrifyingly scary – up there with the best of Alien and Aliens (which it is clearly influenced by) in action and terror. The energy and power driving the story forward just doesn’t let up. The emotional space between the action is fantastic and the performances from all concerned are tremendous. There is not a weak link in the cast, everyone is wonderful. Francis Lawrence is an assured hand on the tiller, having directed all but the first film he knows this story inside out. Every beat of the story has been structured into the adaptation by original author Suzanne Collins and Danny Strong and Peter Craig’s script does superb work in tying everything together emotionally. The special effects, both practical and computer generated, are seamless. The level of detail is incredibly good – this is a believable world we see falling apart. But it is Jennifer Lawrence as Katniss who, as the centre of the books and films, shines the brightest. Katniss is a strong complex, conflicted, independent, intelligent character – not reliant on the men in her life (like so many of the other films and books attempting to leap on the bandwagon) but shaped by her relationships. She doesn’t follow doe-eyed. She leads and wants them to either follow or stay back out of harms way. Lawrence is perfect casting, both steely and sympathetic – constantly carrying the trauma with a sense of acute stoicism. This is a fantastic and gloriously satisfying movie, but you do need to have seen the others first. Thankfully, they are a great watch too. 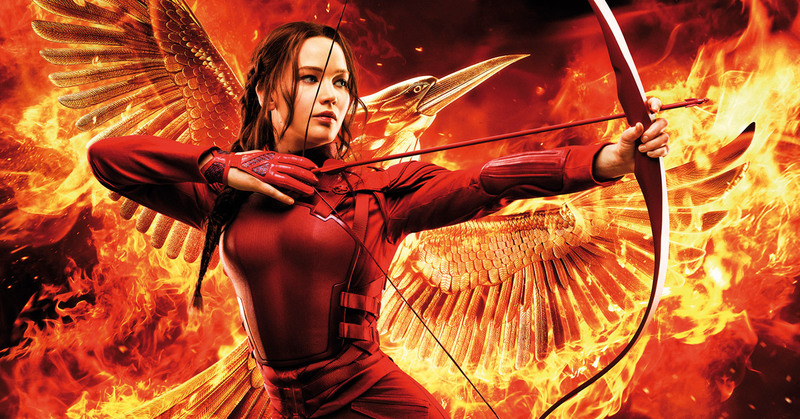 The Hunger Games: Mockingjay Part 2 is out on Blu-ray, DVD and On-Demand now. The Blu-ray also contains a feature length documentary on the making of the film, which is a fascinating and eye opening watch.